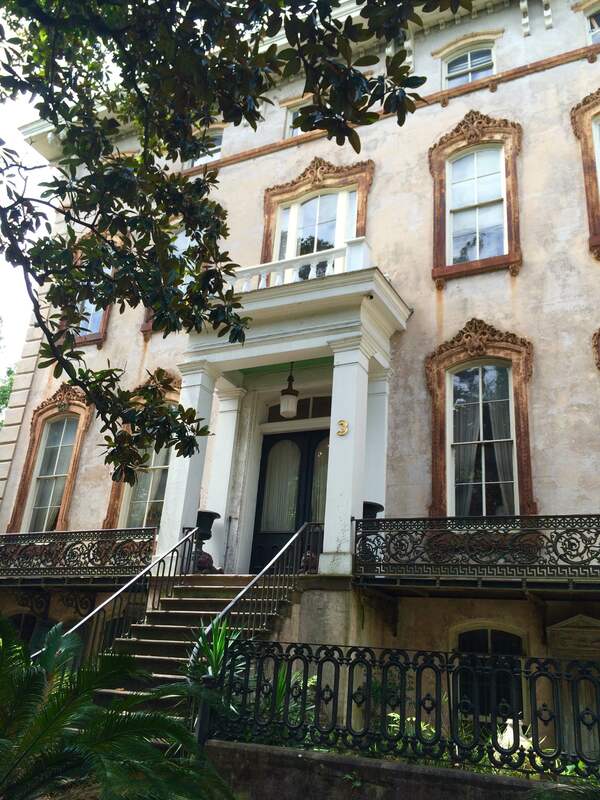 The image of Savannah is often one of genteel ladies in floral dresses and men in seersucker suits sipping sweet tea on the porch of some stately home. I love that image! You know, strolling by that porch and calling out, Hey Ya’ll! 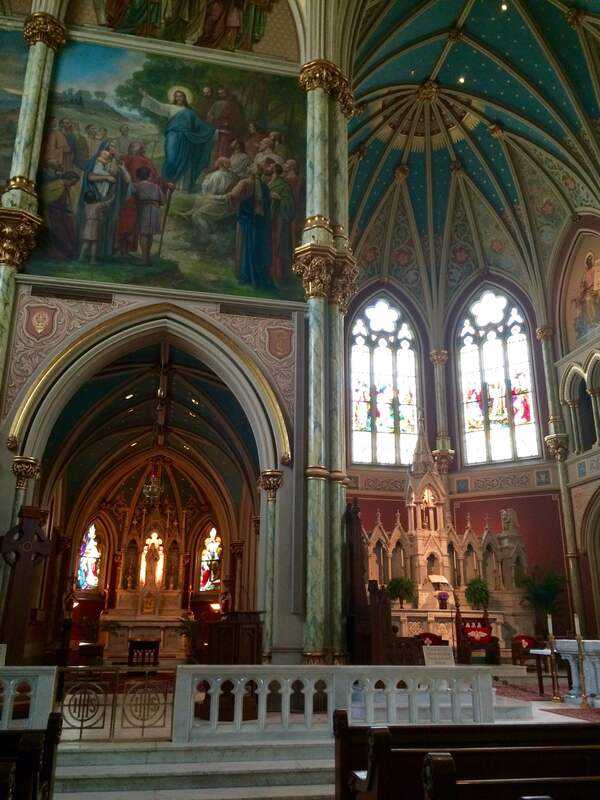 Heck, that image is the reason why I put Savannah on my must see list in the first place. Well fast forward to 2015 folks! This place, so lovingly named The Hostess City and deemed ‘The Most Haunted City’ in the US, is far more than glasses of tea and haunted establishments. Yes, it is steeped in history and very high on the charm meter, but it’s also dotted with wonderful lively and modern spaces. The modern and rather hip (do people still say hip?) Savannah also has an impressive array of finely tattooed young residents and a sea of design students from the Savannah School of Design (or SCAD) scattered about town. The vibe was unexpectedly like the hipster section of a big city mixed in with the small town ambiance. Needless to say I was thrilled by the duality. All that being said, I really wanted to immerse myself in the old school feel. Totally worth it! Heading south? 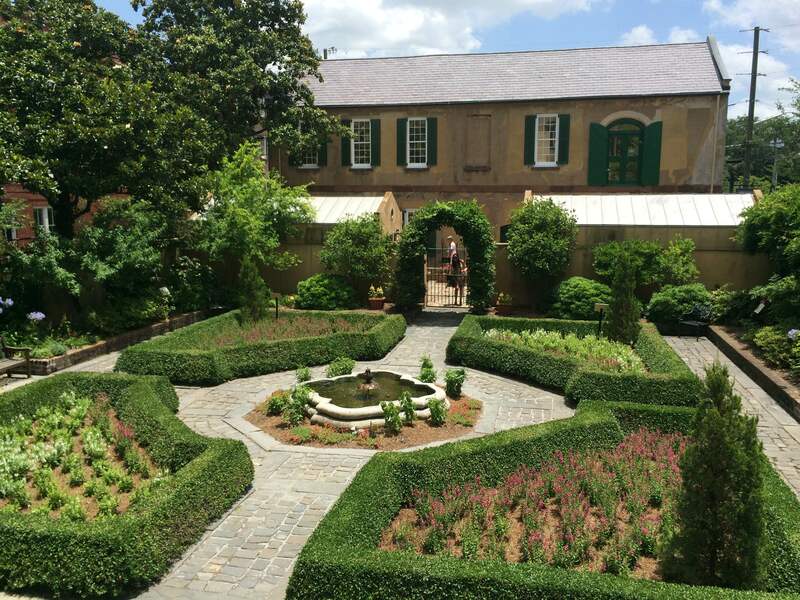 Here are four reasons to make Savannah a mandatory stop during your adventures below the Mason- Dixon line. Hey Ya’ll! Look at those wrap around porches. I want one! By all means, take the obligatory Hop On-Hop Off tour on your first day in Savannah. 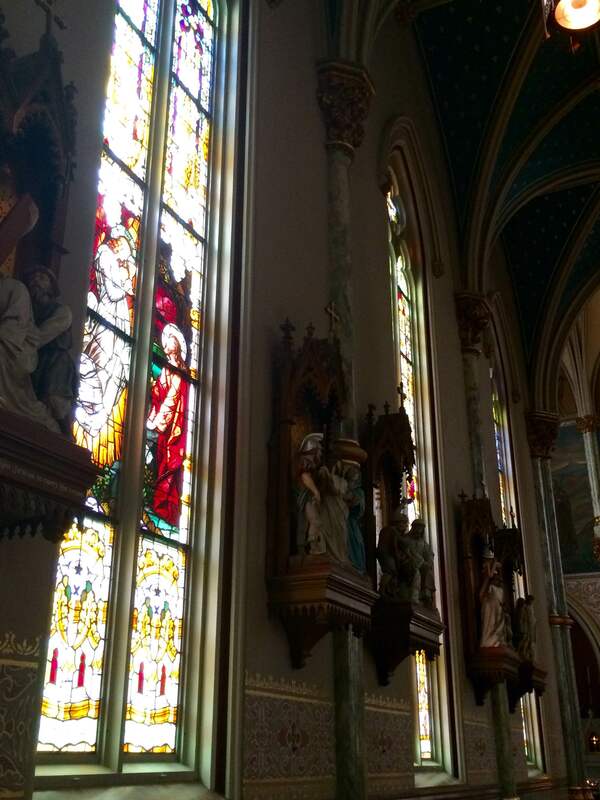 You’ll get detailed historic tidbits about area and people of the region. During your tour make note of areas you may want to revisit later. You can just grab a map and explore further on foot. My basecamp was the Double Tree on West Bay Street. The location was great for walking to River Street, the lively City Market and nearby restaurants. 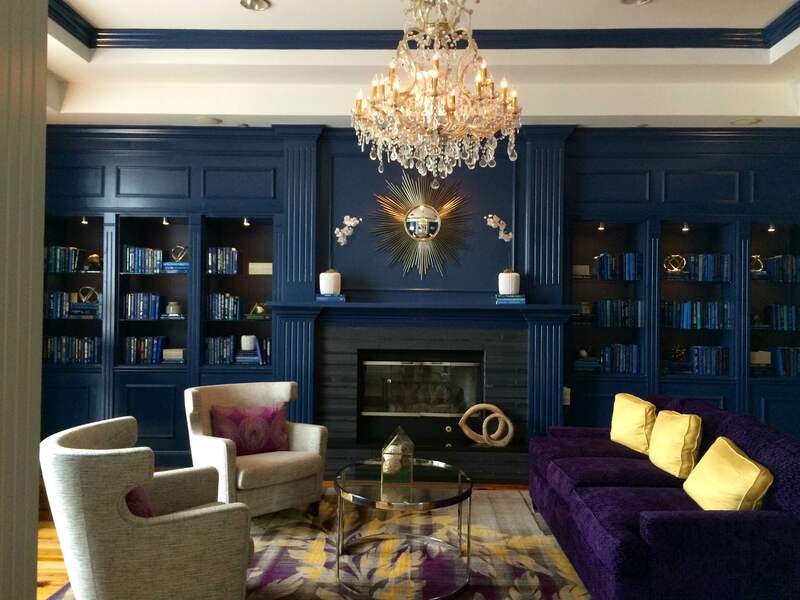 The cozy lobby of the DoubleTree Hilton on West Bay Street. 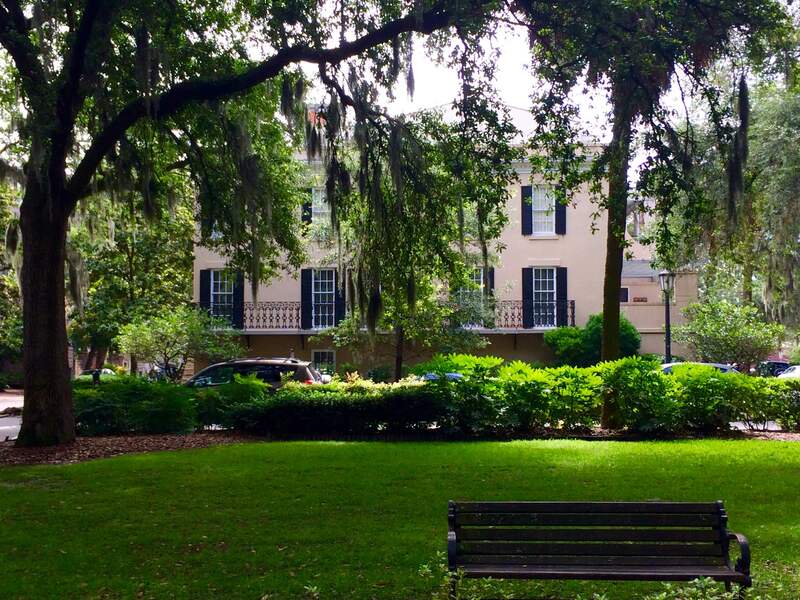 The best times I encountered in Savannah were square hopping and taking in the sights on foot. 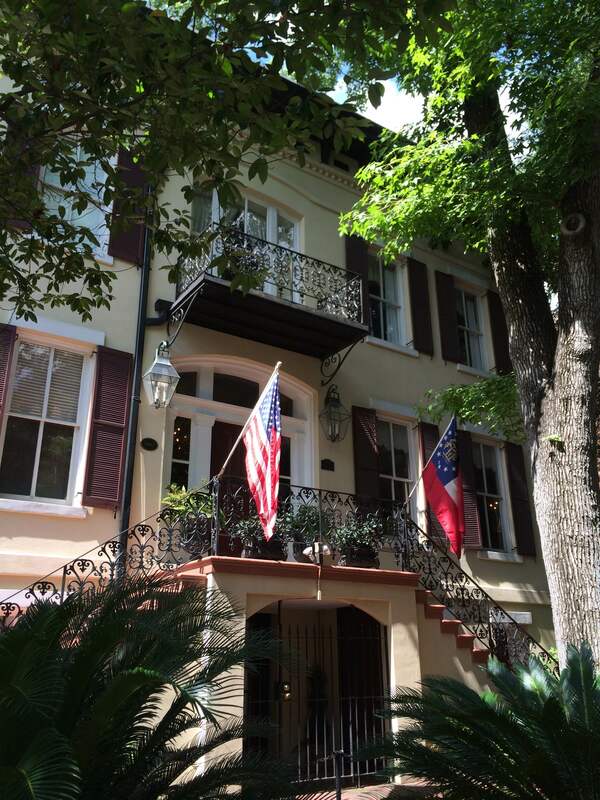 My favorite outing was a sunny afternoon spent walking the length of Bull Street and stopping from time to time to admire the attractive homes. Indulging my inner history geek, I d took a couple of historic house museum tours before heading to the nearest bar and grabbing a beverage’ to go’ (will get back to that later). It was just awesome. 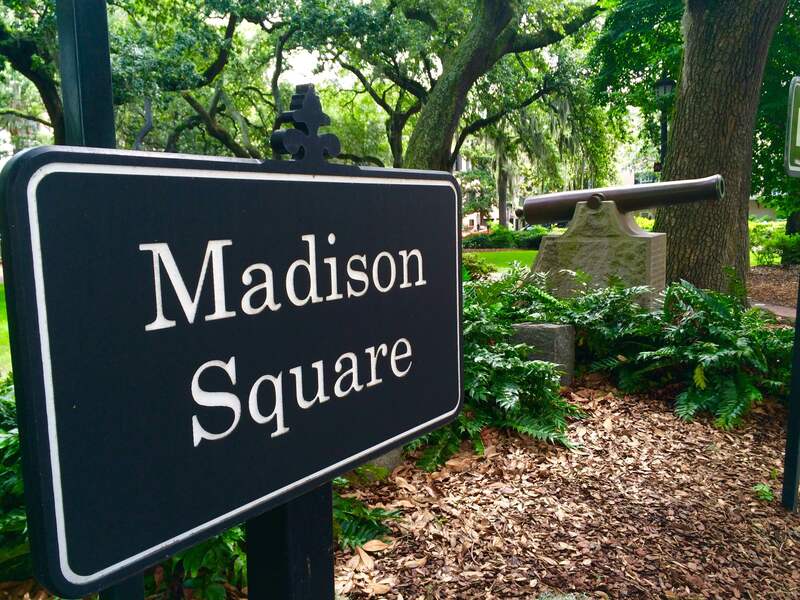 Between River Street and Park Street there are more than 20 public squares each shaded by canopies of oak trees and touting their own personal story (and a monument or two). I tried to visit each one but some held my attention longer than expected. It was hard to choose a favorite but Monterey Square on Bull Street between Taylor and Gaston really stole my heart. Beautifully manicured and surrounded by the kind of homes you imagine featured in Home & Garden Magazine. 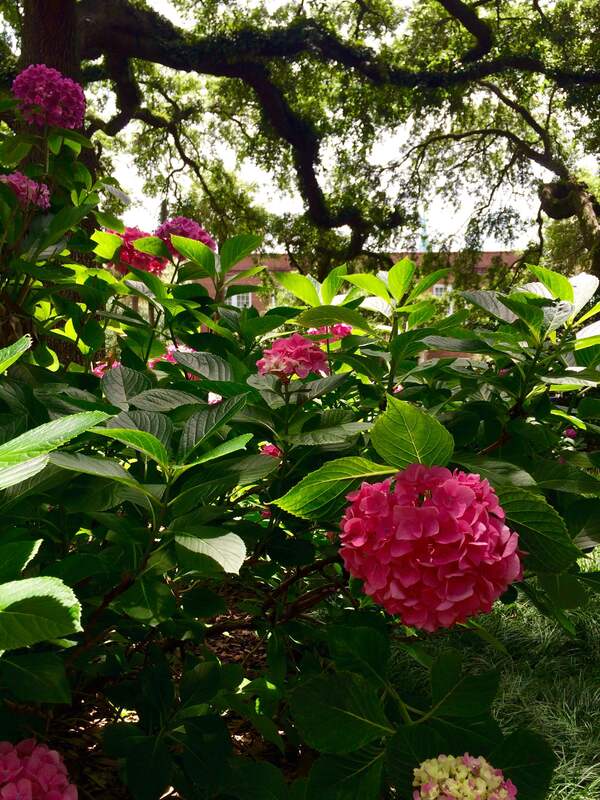 What are they feeding these hydrangea? Midnight in the Garden of Good and Evil anyone? The scene of the crime took place RIGHT here! 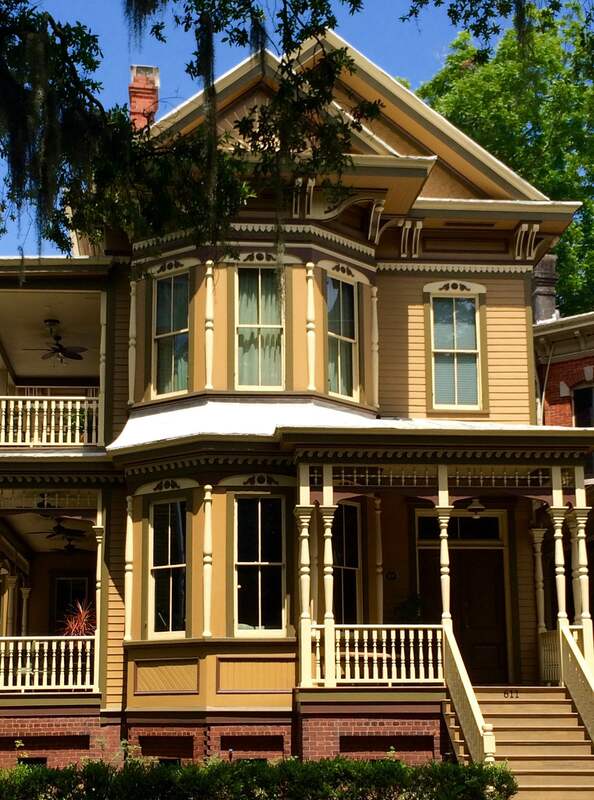 Get your cameras ready folks because the historic district is very much ready for its close up. There are just too many picturesque scenes too ignore. 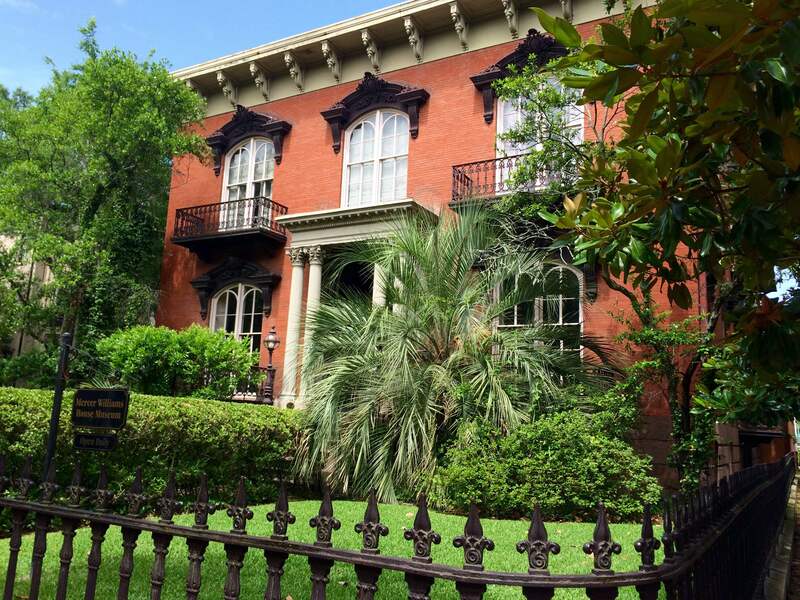 If you are an admirer of architecture and history then Savannah will be proven eye candy and the best part is you can see a great deal of it on foot. 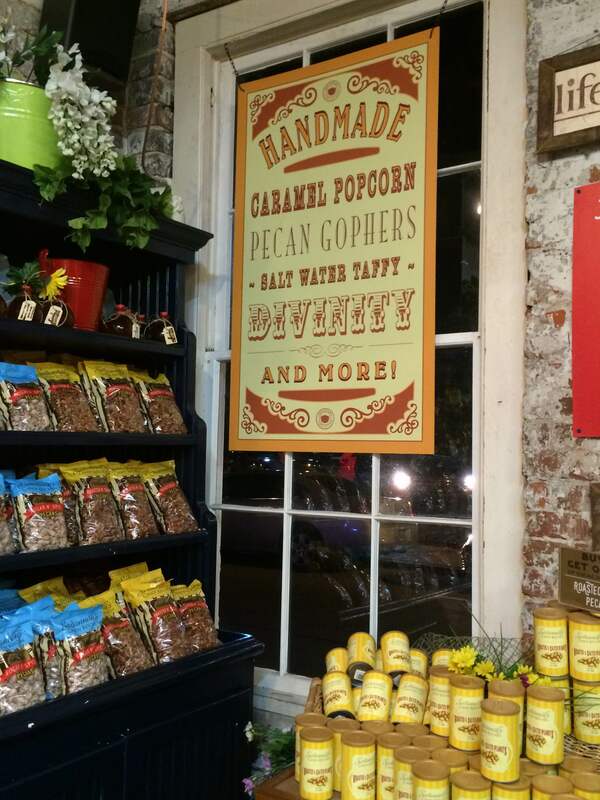 Low Country and southern cuisine is synonymous with this region. If the thought of fried chicken, okra and black-eyed peas doesn’t tip your hat then the area’s abundance of seafood or local BBQ will surely bring you to the table. 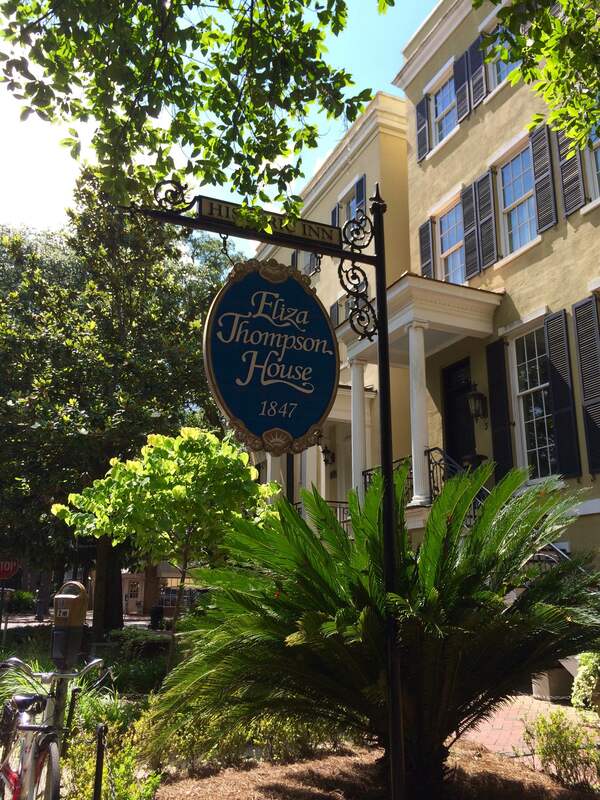 Establishments like Mrs. Wilke’s Dining Room and The Old Pink House are revered for their traditional southern fare and low country offerings. You can be served family style at Mrs. Wilke’s or in dine in the sophisticated surroundings of The Old Pink house, which just happens to me a 18th century mansion. 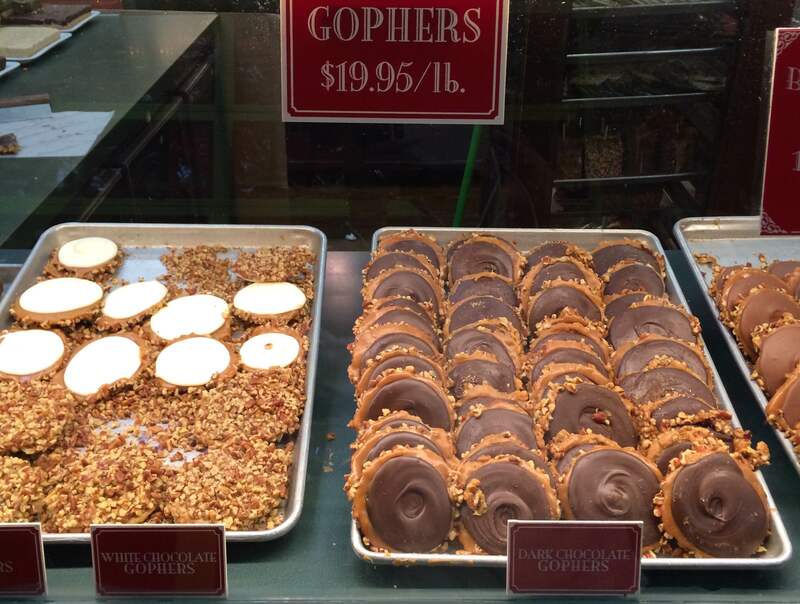 Tradition was bucked for most of my stay instead allowing my taste buds to dictate what I wanted. I was not disappointed. For the most important meal of the day I darn near skipped the short walk to Collins Quarter on Bull Street. You gotta love a place that has an impressive espresso bar, wine lab AND a walk up window. If you have time, skip the walk up window and grab a seat inside. Stay a while. This is the kind of neighborhood café that makes you want to promptly move to the neighborhood. 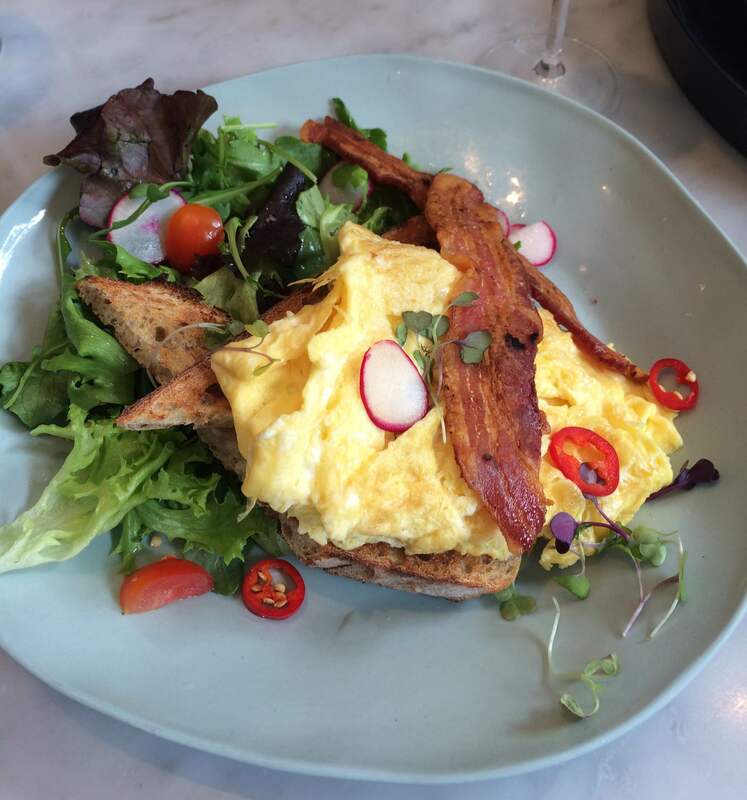 They boast a farm to table menu and single origin coffee. 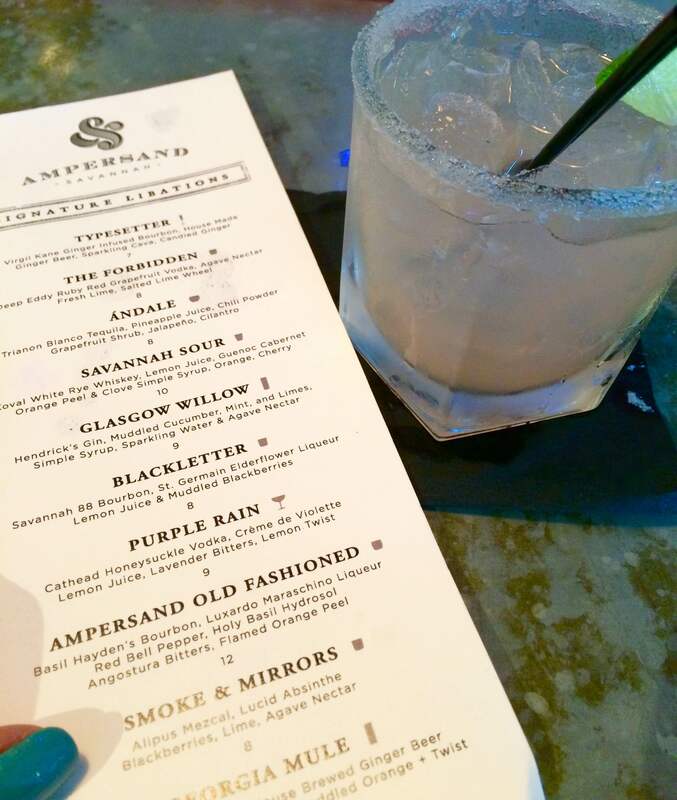 Loved it at first sight – and I’m talking about the espresso menu. Three words – Spiced Lavender Mocha. 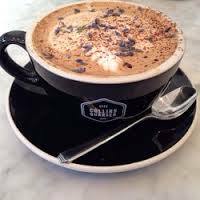 Espresso, Dark Chocolate, Earthy Spices, Lavender, Steamed Milk and sprinkled with lavender buds. Hello?!? Lavender Buds! You need this place in your life. 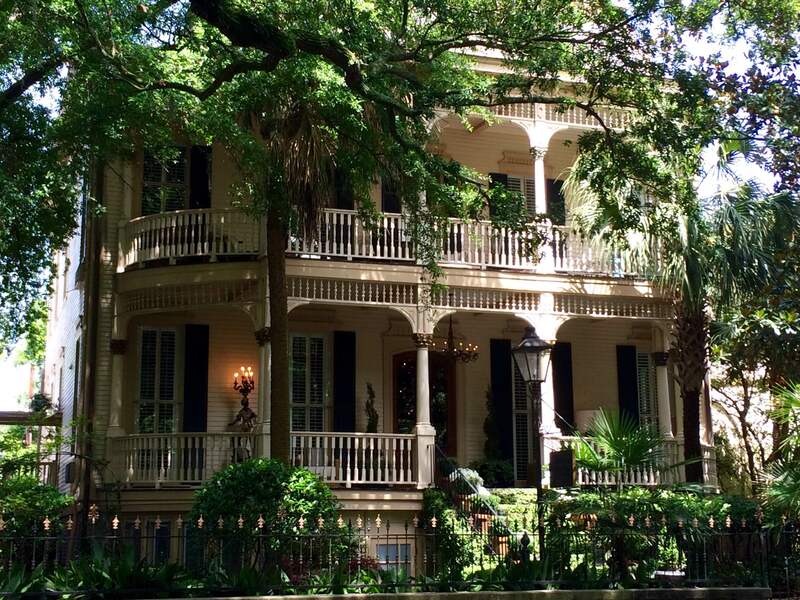 Savannah, I am actually a little jealous that this isn’t in MY neighborhood. Do you see those little red peppers? Oh, they know the way to my heart. 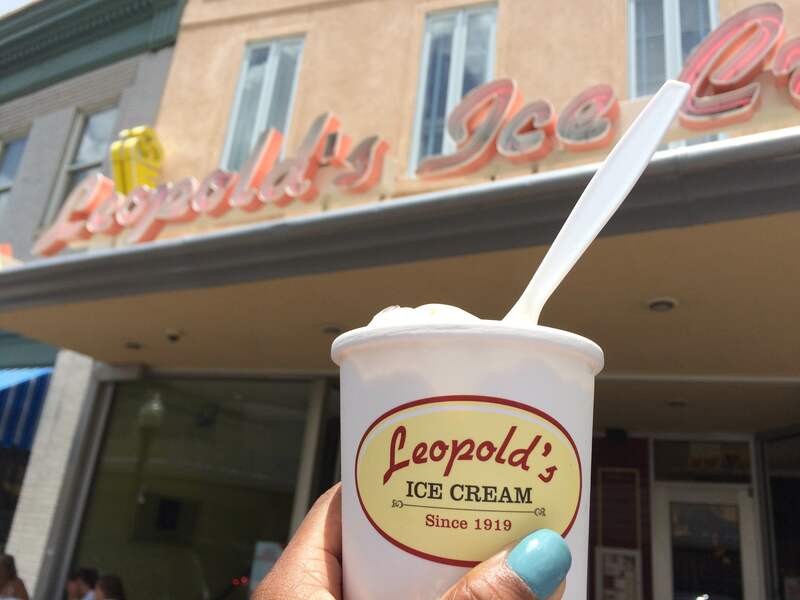 Two historic house tours in a row had me weak at knees so I popped into Leopold’s Ice Cream for a scoop of Rum Raisin and Rum Bisque ice cream. Yes, there will be a line. Yes, it will be worth it. 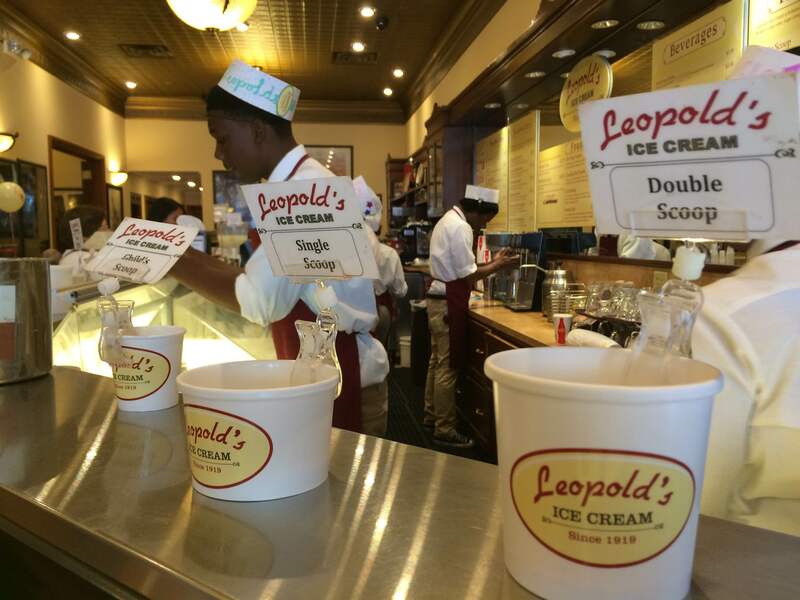 Leopold’s has been a long standing institution in Savannah since 1919. This was the perfect pit stop on a hot Savannah day. 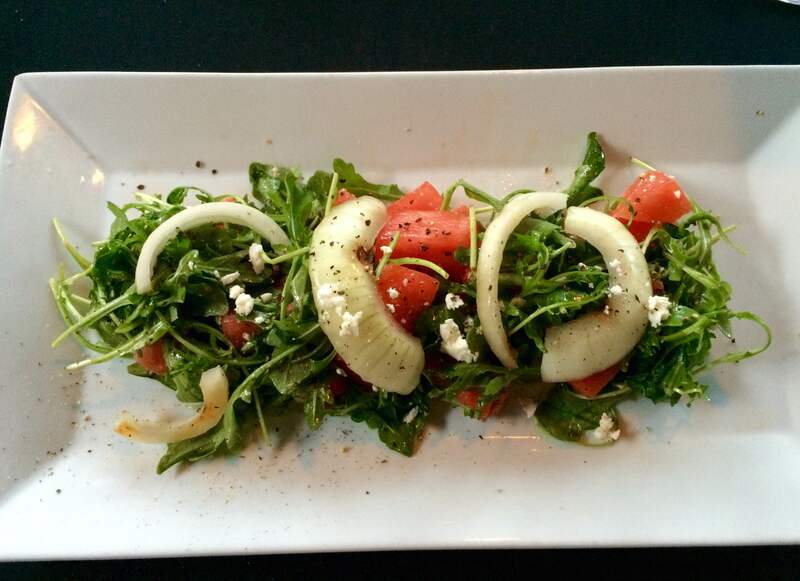 Watermelon Salad – an unexpected option and a delightful way to start my last meal in Savannah. 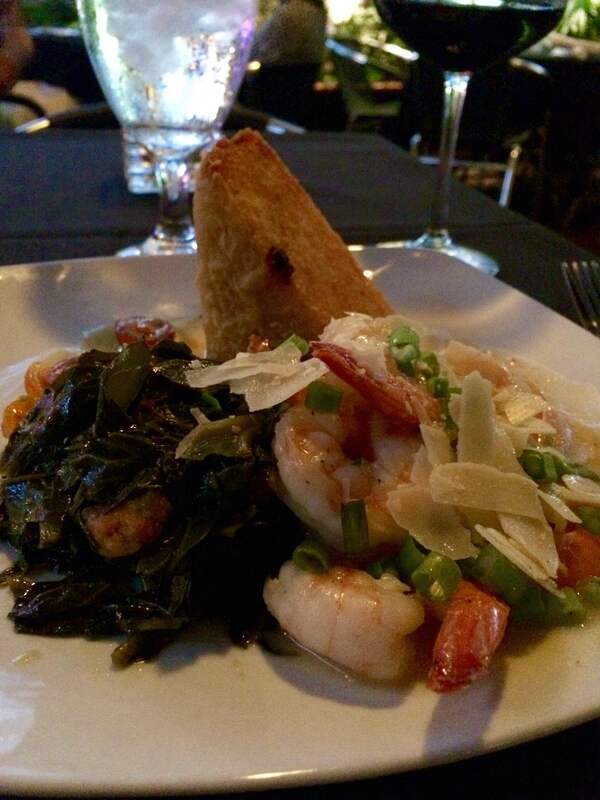 Shrimp, Greens & Grits oh my! You can’t really leave the area without trying Shrimp & Grits. I left it to the last meal and I was so thrilled with the dish that I would have gladly eaten it again if I had another day. Shrimp, applewood smoked bacon, crisp stone ground grit cakes, collard greens, chardonnay butter sauce, heirloom tomatoes, green onions, and Parmesan shavings. Wow. This ain’t your mama’s shrimp and grits. Gotta a Sweet tooth? 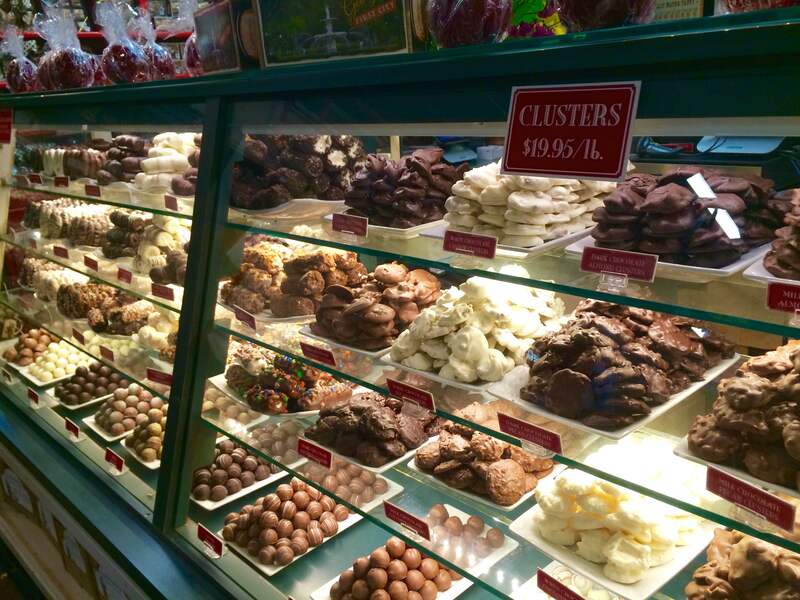 One stop shopping at the Candy Kitchen for your praline, fudge and chocolate truffle cravings. Never heard of Gophers before this trip but glad we met. You want it? 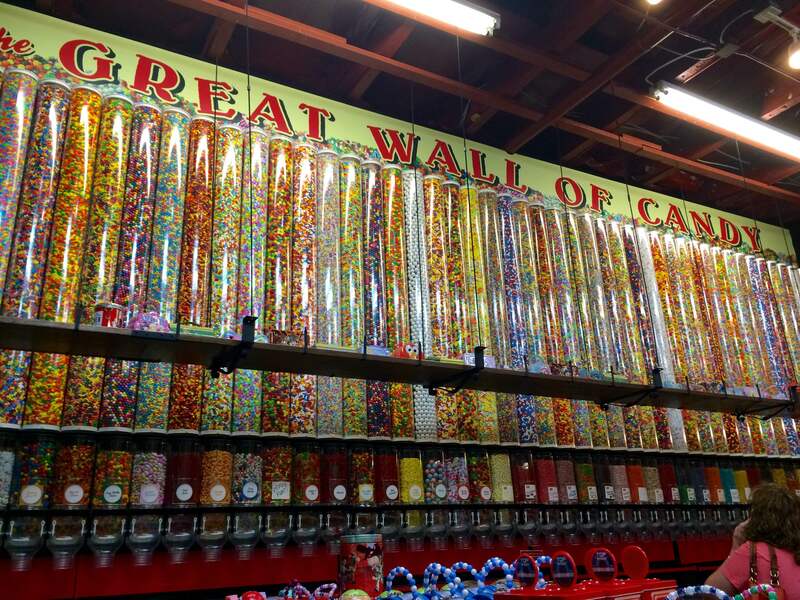 They’ve got it at the Candy Kitchen! The Collins St. Germaine Mimosa at Collins Quarter. Taking brunch to the next level. The Forbidden. Looks innocent enough but don’t be fooled. It will make you want to buy grapefruit vodka by the gallon. Dangerous. Lychee Martini at Flying Monk Noodle Bar. Garnished with a lychee fruit. 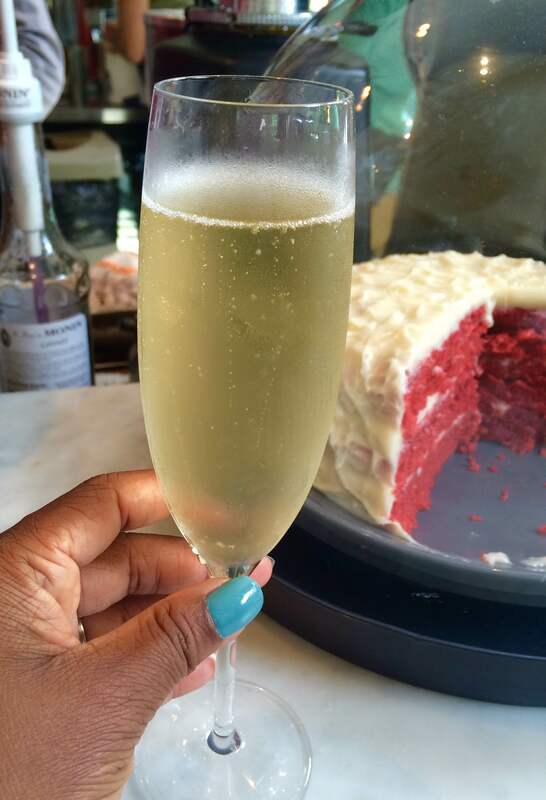 I wanted to dive head first into the beautifully fragrant drink. It’s like subtle magic in a martini glass. It makes for a wonderful companion to the spicy dishes on the menu. 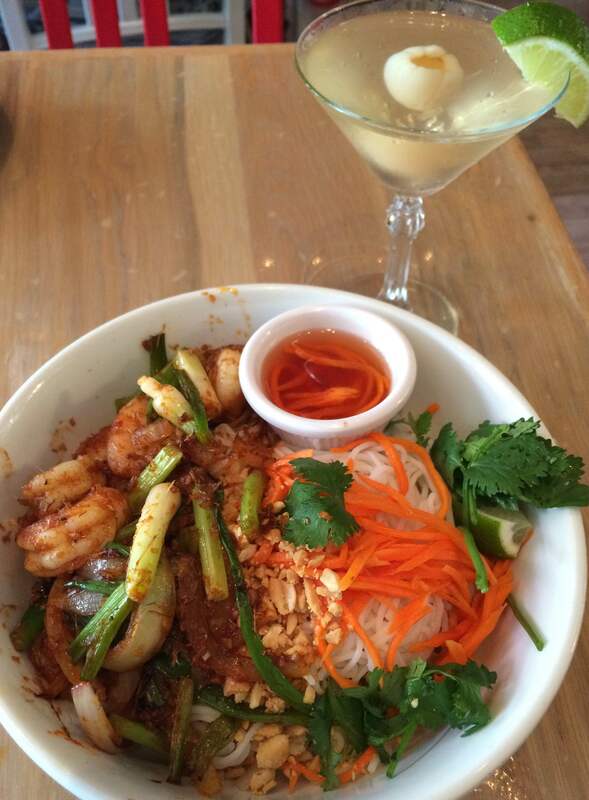 Red Spicy Noodles and Lychee Martini from Flying Monk . Seriously, why didn’t anyone tell me about lychee drinks before? This was amazing! 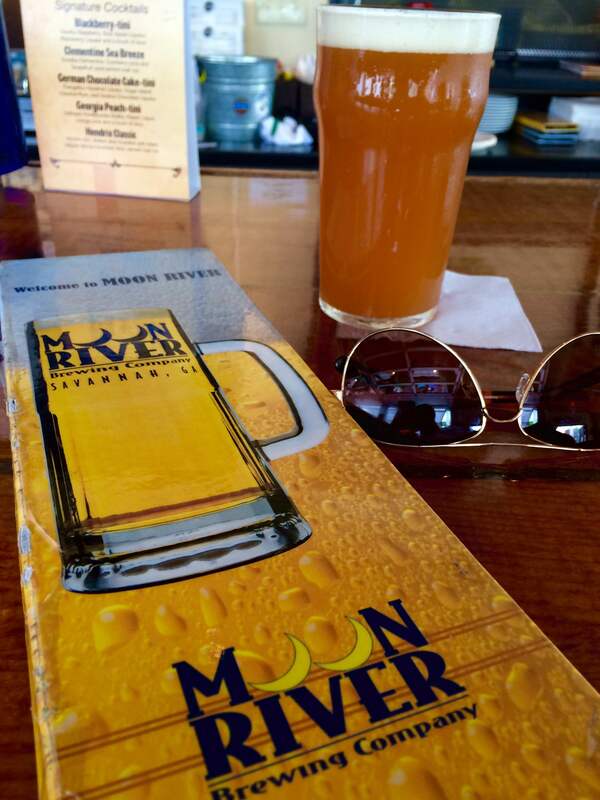 If you prefer hops in your glass (or red solo cup) then Moon River Brewery Company is a wonderful stop. 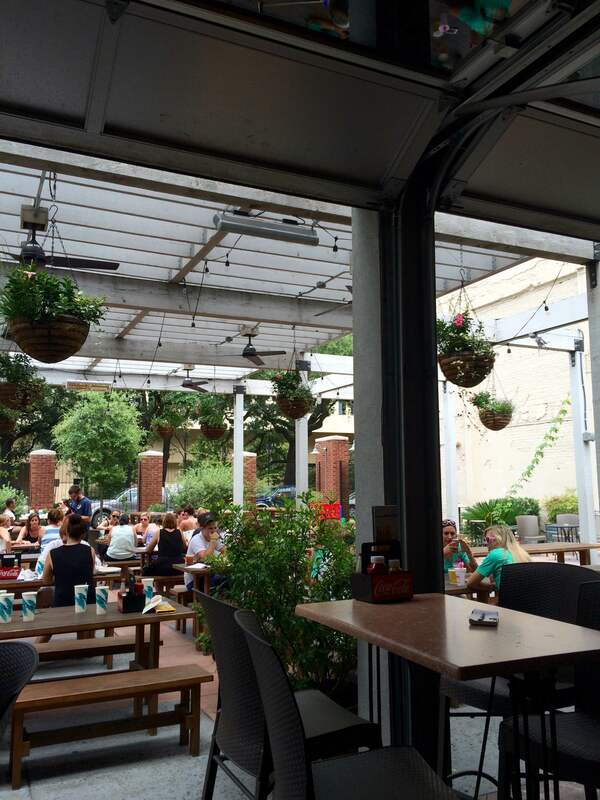 They have a lovely beer garden where you can grab a bite and choose from a well-rounded array of beers on tap. AND ladies and gents, Moon River is rumored to be haunted. 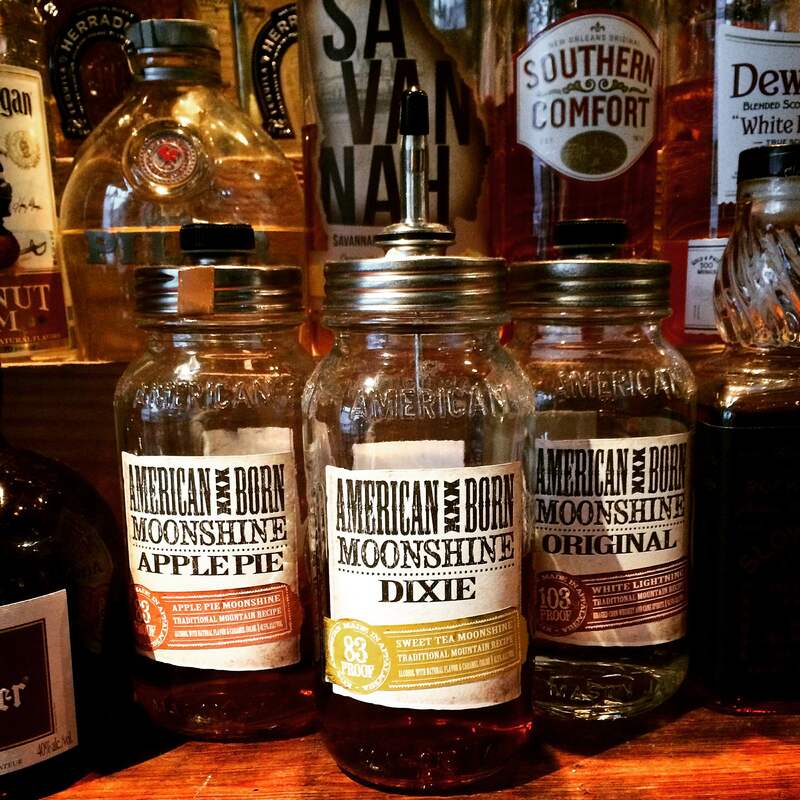 Of course when you are in the south the possibility of moonshine appearing on a menu is highly likely. Don’t judge, just let it happen. In the famous words of Matthew McConaughey, Alright Alright Alright. The open containers laws are very generous, but remember they only apply to Historic Downtown Savannah (where I think you will be spending a lot of time); can be no more than 16oz and containers must be plastic. 4. 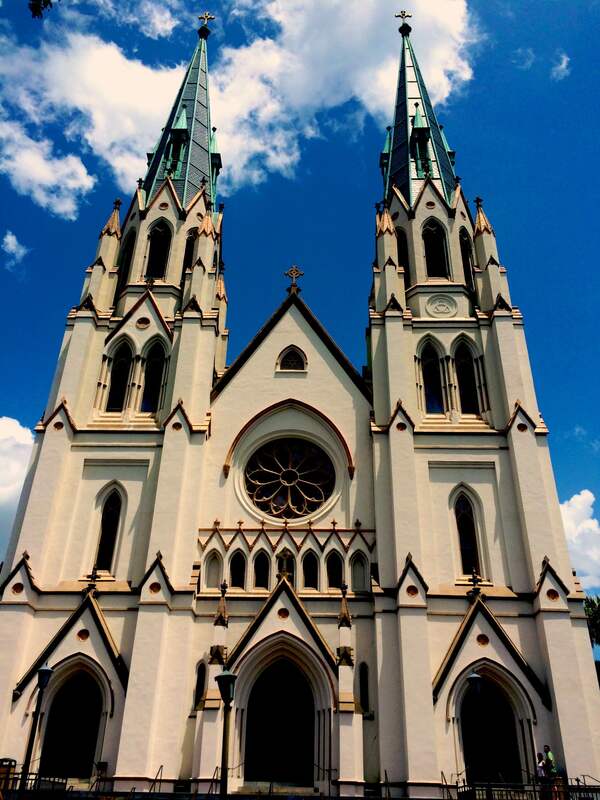 Lastly, Savannah is just easy on the eyes. She is so cute! 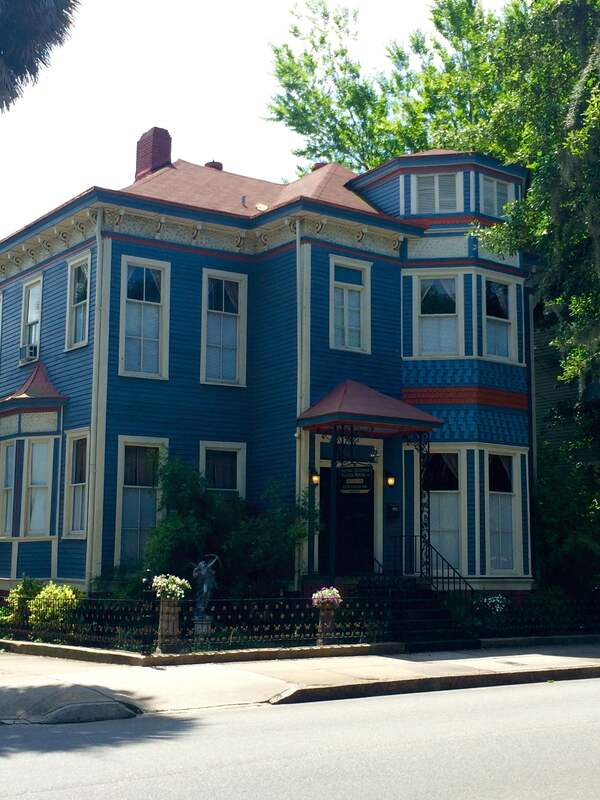 Yes, this Historic Inn is also rumored to have a resident ghost. Better still, go have discover it for yourself! Shiny & New or Old & Eclectic, whatever your pleasure, mix them up and you’ll surely enjoy Savannah. 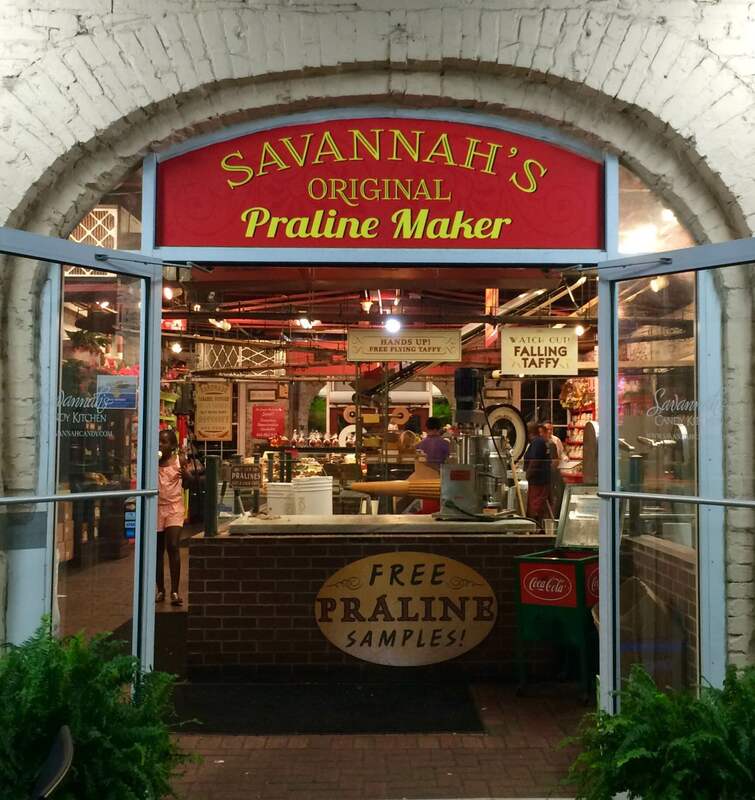 Have you been to Savannah ? What was your favorite part?